Horses that compete at high levels in strenuous sports are able to do because they’ve been properly conditioned. Gradual build up to that level allows muscles and tendons to adapt to the physical stress involved in the sport. When your horse walks, trots, canters or gallops, a very important structure kicks into high gear: the tendon. Tendons allow the muscles to do their job of moving a horse forward, as well as sideways and back. You can take your horse’s tendons for granted until something goes wrong. Without healthy tendons, your horse’s soundness can be severely compromised. The tendons, located in the lower front and back legs, are flexible bands of tissue crucial for locomotion. Unfortunately, they are also very prone to damage, and are typically compromised in a few certain ways. One of the ways a horse can damage a tendon is through direct trauma. This can come from a cut to the leg, or from kicking a barn wall or the inside of a trailer. Some horses injure their tendons by stepping in a hole or just coming down on the leg in the wrong way on bad footing. Strain is a common cause of tendon damage, and is brought on by overuse. Jumpers are particularly susceptible to tendon problems because of the pressure on the tendons in the forelegs when they take off and land. Another cause of tendon damage is what veterinarians call “progressive trauma,” which is essentially degeneration of the tendon tissue, followed by an injury or overuse. Each of these issues can render your horse unsound. What’s worse is that once you horse suffers a tendon injury, he is more likely to reinjure that same tendon, since tendons aren’t good at healing. Look for hazards. Make sure your horse’s stall, paddock or pasture is free from wire, pieces of metal or anything else your horse could cut himself on. If you are using barbed wire to secure your horse, switch to a safer fencing material. Horses can easily slice their tendons on sharp wire. Condition your horse. 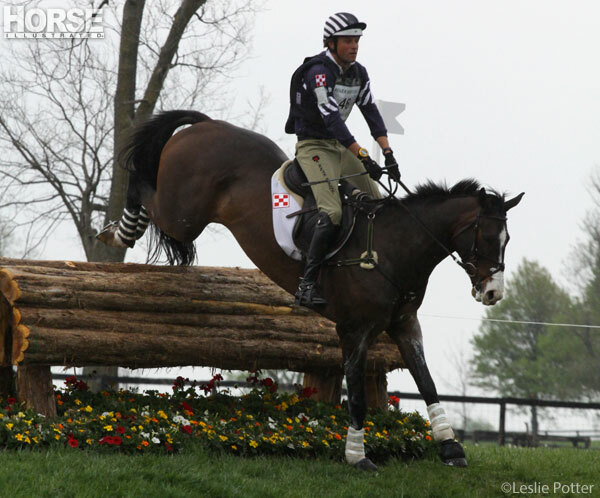 Before you compete in any strenuous sport with your horse, make sure he’s in condition for it. Whether it’s jumping, endurance or barrel racing, your horse needs to gradually build up to these activities. This allows his muscles and tendons to adapt to the physical stress involved in the sport. Ensure proper hoof care. Whether your horse wears shoes or goes barefoot, be certain you’ve got a good farrier who knows how to keep your horse’s feet in balance. Be sure to stick to a regular schedule of 4 to 6 weeks with trims and shoes. Warm up before exercise. Never take your horse out of a stall where he’s been standing for hours and turn him loose to run in an arena. Hand walk him for 5 to 10 minutes first before giving him a turnout. Likewise, warm your horse up under saddle with at least 10 minutes of walking before you begin a strenuous ride. Watch your footing. Be careful not to ride your horse at fast speeds over uneven ground. If you are trail riding and hit a rough spot in the trail, bring your horse down to a walk. Make sure arena footing isn’t too deep or uneven, since this can also make your horse prone to tendon injuries. How can you tell if your horse has sustained a tendon injury? He will likely be favoring one leg, and will show heat and swelling between the knee and fetlock (foreleg) or hock and pastern (hind leg). 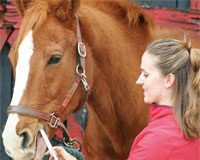 If you suspect your horse might have a tendon injury, stop him from exercising and contact your veterinarian right away. Don’t wait for it to get worse. The prognosis for a mild tendon injury is much better than for a serious one.